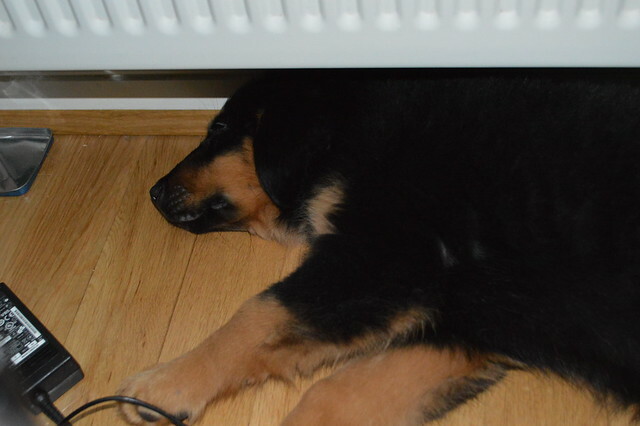 Yes I know, I can't quite believe it myself, an actual knitting post ;-) It helps that the puppy is finally having a snooze, he got to that overtired and bitey stage which isn't much fun. So then, what have I been knitting? The sweater is for my son using the Little Spare Time pattern. I've rejoined the knitting after doing the front and back flat for the pockets. I think now I'm about ready to do the edging but I want to try it on him first to make sure the length is right. It shouldn't be far off but as my gauge wasn't quite right I'd prefer to make sure. Oh!! What a cute puppy!! Love your red project - the your tension is so even!! And this sock is just a splash of color - beautiful! I don't think I knit for the first two months of puppyhood. They are so busy!! love your projects and hope you get some knitting time tucked in here and there. Oh your Pippin - what a love! I bet your son is eyeing that sweater and waiting for it to come off the needles - looks great!! A puppy is another child. He is flourishing so well under your roof. He has grown! Oh, your puppy is SO cute! He does look too big for a sling though. Puppies grow a lot faster than babies, don't they? Yay for some gorgeous knitting - what lovely colours of yarn you have and oh sweet puppy - I think that might be the right place to be right now! Is it bad that I am thrilled to see puppy photos?!!! I love the knitting, but the puppy!! What an adorable little puppy!! I have a few crochet projects going but they have been at the lay side for over a month now. Since the time change I just can't get back into the groove of anything!! Love your WIPs especially the rep romper. Of course the puppy is taking up your time, I can totally understand why! 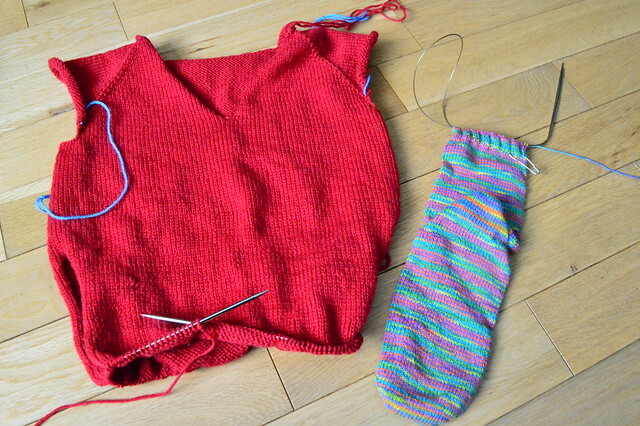 Your projects are coming along nicely though as well, lovely sock.